Lots of food trends involve expensive or hard-to-find ingredients, complicated preparation or some other reason to not try it at home. But one thing I never saw until a couple of years ago, and have since seen it dozens of places — a pretty good definition for “trendy” — is the wedge salad. This is the exception that proves all the rules for trendy foods: It’s actually easier than a “regular” salad. This is a really short one, only one step that I haven’t already written up. Prep all the toppings first. Core and quarter the tomatoes. You can core it first, or cut the stem out after you quarter it. Then slice the bell pepper, and peel the cucumber. Finally, core and quarter the lettuce. See those pieces? That shape is called … umm … let’s see, it was right on the tip of my tongue … oh yeah! Wedges. 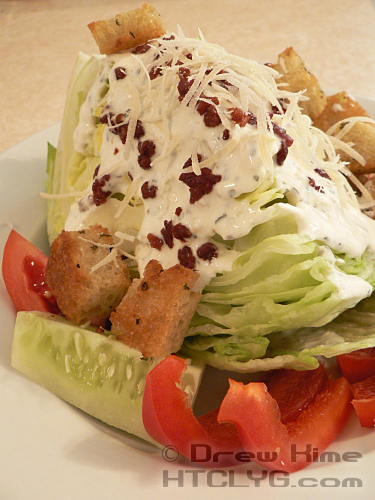 That’s what makes it a wedge salad. Just take an entire quarter — one wedge — and put it in your salad bowl. If you really want to extend the theme, cut the cucumber and tomato into wedges too. Add the rest of the toppings, and that’s it. 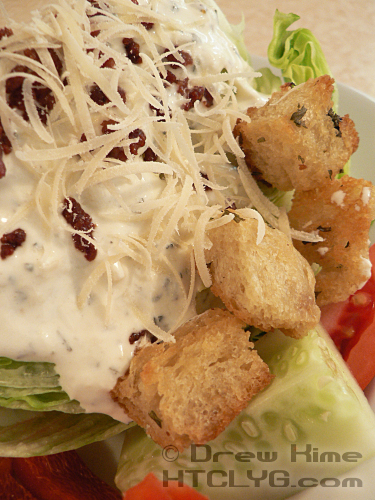 Coming up is the dinner that went along with this salad. I went trendy with the salad, so the dinner is about as traditional as you can get. Sign up using the form to the right to make sure you don’t miss it. 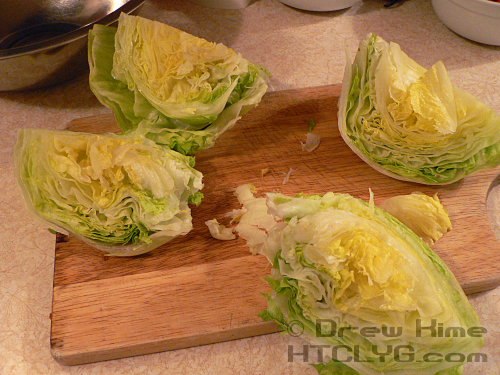 Peel any brown leaves off the outside of the lettuce, core it, and cut into wedge-shaped quarters. Core and dice the peppers. Nope, no wedges, just dice them. Place the lettuce wedge point-side-up in a salad bowl. Place the tomatoes and cukes alongside. Top with the remaining ingredients. Congratulate yourself for saving $8.50 -- what it cost at the restaurant where I first had this.